A 3 years old male at his prime bred from German police bloodline is a perfect protection dog for security and family. He has undergone a thorough to achieve high scoring in IPO 1 title. 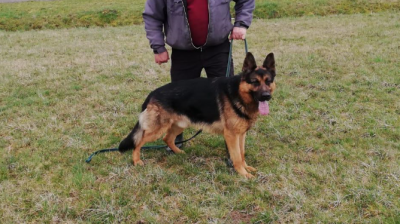 Based on selective breeding standard for police work, he has been cross-bred between Show Line and Working Line German Shepherd lineage to produce a dog with fine ability to work while retaining the appearance of a handsome male German Shepherd. Below are some interesting facts about this dog. Black and tan color with short coat, with dark pigmentaton. Fully trained and attained IPO1 working standard, we have shared some videos here on his well endowed capability. He has also scored SG for Show rating significantly a Star in the show ring. The dog has been raised with family and knows how to socialize with children and family. Very confident in any kind of environment and being matured in physical and mental development he is ready to move to new to start working. Once the dog has arrived, training will be provided for readjustment and handed over to the new owner through 3 handover sessions and follow ups. We will handover the local certificate to the new owner once the pedigree matters are processed by MKA.